We were really excited to be able to fly this month. As you may recall from our June meeting, we are now flying year round, and started the new cycle with this launch. We also decided to set up earlier to avoid the potential of early afternoon thundershowers. Despite the temperatures, we had a full turnout with several new flyers too. WELCOME to Bill, Paul, and Robby, and David and Lindsey G. We’re glad that you came! The low but variable direction winds (variable in direction at various altitudes) in the morning caused us to be guessing on direction to fly, and we almost lost 3 of the 4 first flights for the day. Fortunately, after some coaxing, Jason Campbell’s X-15 was recovered from a tree from the ground with Tom D’s pole. This initiated the pole and showed it’s usefulness and short comings. By the afternoon, we already launched 3/4 of the flights. We had a full day of shooting right up to the last rack just past 2:00PM. Tom D’s “lost in the tree but recovered and rebuilt “Lawndart I” started the day, with a “non-name bearing” perfect launch. 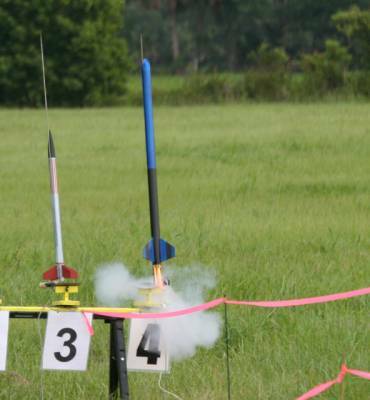 Today, Tom and Brian once again made us smile with 5 microMAXX rockets. 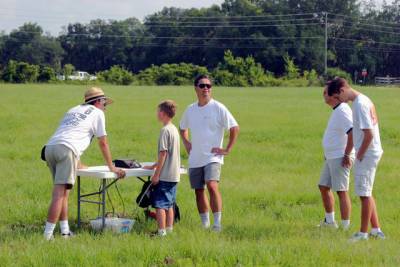 Congrats Brian once again on the lowest altitude successful flight of the day! Dan Woller sent up his “Strobe” rocket with an altimeter. Brian’s Scale Saturn received some more “Ohs!!”. 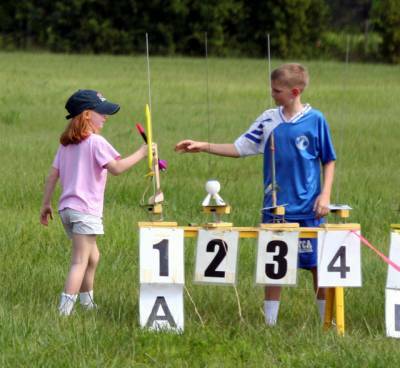 Robbie T.’s Dad Bill got a quick lesson on flying and building rockets and had several successful flights with their “built at the launch” Alpha III! Roger brought his EZ -Glider and flew a really nice and long duration flight. Many different rockets. 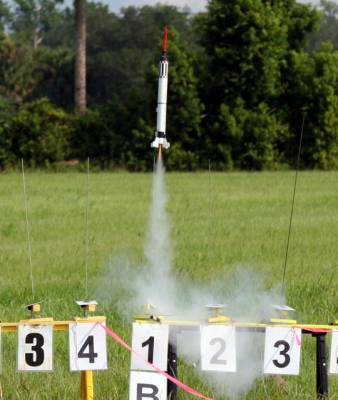 With no CATOs like in April, and only one core-sample, we had a very fun and exciting day of model rocketry. 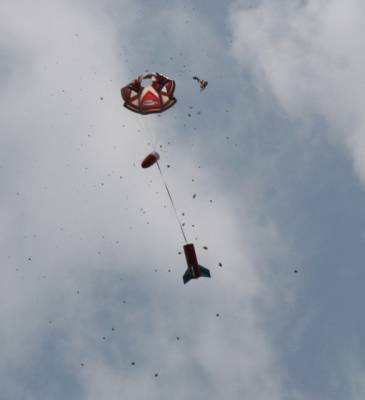 Chris H. also sent several of his cluster birds into the air. All total, he had 5 successful cluster flights for the day. Good flying! What a great day for a launch! See you on Saturday, August 4th for more fun, sun, and flying. !